An 'almost' daily entry of the days painting projects, demonstrations and general art thoughts. Today I thought I would write a bit about my journey as an artist. I hope you will find it interesting and inspiring! I posted it some of it on my Facebook page, so some of you may have seen it there. 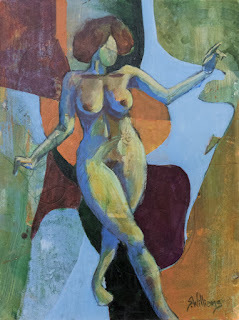 I have decided to go back to doing some figurative work, revisiting an idea I explored almost two decades ago. I have begun again to go to live model drawing, weekly since June, skipping the summer months, and boy was I ever rusty! I had never been taught how to draw the figure or portraits (even in art school), so my learning has been up to me. It is exhilarating, depressing and exhausting, but I know my efforts will pay off if I stick to it. The internet has become a fantastic tool to learn just about anything by, often at little cost compared to live workshops or classes, and learning to draw is right up there. 12 years ago when I began to work with the figure, there was hardly anything online (heck was there even internet back then :)?) Learning figure drawing from books is a very difficult way to learn for a visual learner like me! While I was looking for great figure drawing lessons, I came across two videos that I think are valuable to watch, not just for artists, but for everyone. The first is found here, called "How NOT To Be An Artist". Pretty funny and right on. The other is a video on "How To Practice -Improve your Art Skills (or any skills) the Smart Way". Find it here. Please let me know what you think of these when you are finished watching them! Now, I am pretty insecure showing anyone my efforts thus far, but hopefully will begin to do so more as I become more comfortable with the process. I am showing you one of my latest explorations above -done from a 2 minute sketch done on a painted background I had from an old Jane Davies class, and then painted. I love how the background shows through -I used to do something similar, but in an entirely different way. Here is one of my old figure paintings. The figure was done from a photo rather than from life, and that is NOT what I want to do now! My favourite thing is to combine what I have already 'mastered' with the new thing -always a challenge that allows me to continue to grow as an artist. 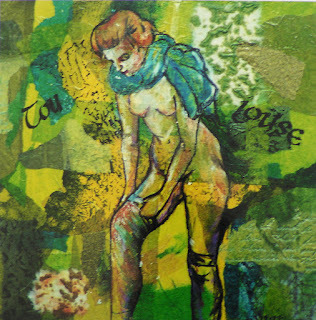 So I want to PAINT the figure as well -Oil, acrylic, collage, watercolour, pastel -media that I have learned to use, by putting in all the hours and hours of hard work described in the video above. Oh, and there is abstracted realism, which I find fascinating and WAY more difficult and visually interesting than pure realism IMHO. Never satisfied with copying anything, I need to find my OWN way to express what I see and feel. Now that significantly ups the stakes, as not only do I need to learn HOW to do something, I need to learn how it looks MY way. Of course that means LOTS of work, trial and error, and the subsequent MOUNTAIN of failures. Not for the faint of ❤️. Wish me luck (and sanity). Thank you so much for the comment Belinda. This blog has been left dormant for a long time as I didn't feel that I had enough content to justify it, let alone the sheer amount of work to produce a blog post that is helpful as yours is. I may just have to give it another go! !